The Coralsnake fires up his time machine and takes you back to Monday, June 3, 1968. So, you are from the future hey? You said you were interested in Shelbys? We get a lot of visitors on the New Jersey assembly line. But we don’t get many visitors from 2011. Sorry, I can’t ask more questions, because I stay pretty busy here as you can see. Did you know a few years back, they actually made a music video on the Detroit line? I don’t think the guys around here would put up with that. So, this is it . 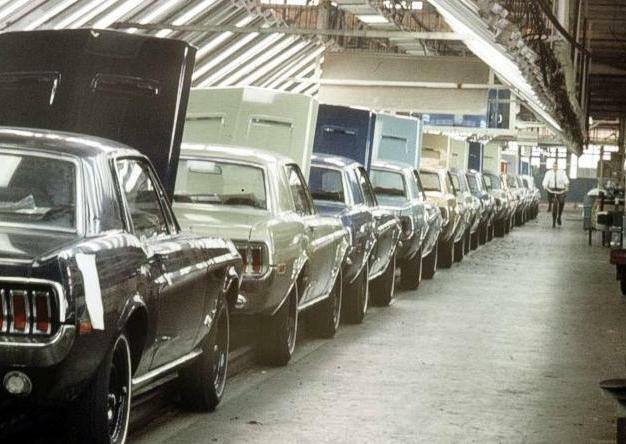 . . all Mustang production. No Cougars here like the other two plants. We just build Mustangs. The best ones Ford has to offer. We are on track to build over 100,000 cars this year and that’s including the strike. Last fall, we were off from work for over two months. There were a lot of hard feelings around here. But, I think we are over that now. I remember coming back to work and the line looked just like the day I left. The same lime green coupe at my station. Well, it did have a quarter inch of dust on it. So you are probably wondering why this green convertible is missing a lot of parts? It’s one of those Shelby cars. We are on track to build over 4,000 of these things. They come off the line this way and then they are sent back to Detroit where they are finished. The company that finishes them was building Corvettes last year. Can you believe that? See this number right here? It’s number “486”. That’s a rotation number. It matches this build sheet. The build sheet tells us what parts to put on the car. We don’t even look at the Vehicle Identification Numbers. As you can see, they are not in order. Most of the guys don’t like these cars. They are loaded up with options and we don’t get any extra time to do them. Personally, it doesn’t matter to me, I just get to skip over them. Did I mention I was from New York? The Yankees play the Twins tonight. I know, the Yankees haven’t been doing to well the last couple years, but we can beat the Twins. We still have Mickey Mantle you know? Do you like this little six cylinder coupe? They are pretty popular at the dealerships. Most of the cars that come down the line are six cylinders coupes or 302 / 2 barrel coupes. The other cars get all the attention like that Shelby that just went by. This color is Acapulco Blue. Rotation number 488 . Boy, this baby is loaded. I like the fastbacks myself. It’s not really a “Yankee Blue”, but it sure is a pretty car. This thing is loaded. Take a look, power steering, power brakes, air conditioning and the fold down seat. It’s like having a Shelby, only much cheaper. The motors are the same you know? The same J-code engines are in these Mustangs. I told the guys, I always get these interviews because I am so good looking. They keep telling me it’s because I talk so much. I probably don’t have to tell you about the election this fall. It sure looks like we are going to have Kennedy’s brother as our next president. Let me tell you, we like that in the plant. So, are you getting all this down? 490- six cylinder coupe, 491 –six cylinder coupe. That’s the way it goes all day long. There is always another Mustang on the Meutchen line. We build several hundred cars everyday. In another eight weeks we will be switching the lines over for the new 1969s. At least we won’t have to build the Shelbys anymore. They are going to build those on the Detroit line. Rotation number 492 you’re up….Let’s see a six cylinder coupe! Oh look, box “D-22” is checked off on the build sheet. That means this car is a sprint car. It’s a special promotional model. Yes, look here it has the chrome air cleaner. This color is Meadowlark Yellow. I have never seen a Shelby that color on the line yet. They only come in certain colors. 493 you’re on deck. Two sprint cars in a row! I have always been partial to that Lime green. It’s a very popular color now days. It reminds me of the Jets. So, you like football? I am a big football fan too. You know when your from New York, there is only one question you get asked? Do you like the Jets or Giants? I like the Jets. They are going to really strong this year. The Giants will be lucky to finish at 500. When you have Broadway Joe Namath, you can go to the Super Bowl. That’s what they call it now….the Super Bowl. Number 494, I like this one, no radio, no options. It makes my job much easier. This one is painted color code “N”. You don’t see many of these. The color is Diamond Blue. That is when the parts runners keep this bin full. If I run out of bolts, I can use these screws. The foreman said it was okay. You have to keep the line moving. Rotation 496. Oh baby, look at you. This is the car every kid wants. It’s a red, “GT” Mustang fastback. Personally, I see these red ones everyday. Not my favorite color. The only difference between this car and the Shelby is this one has all its parts when it leaves our lines. Are you still taking notes? Let’s see since you stopped by, that has been eleven cars. The first one was a Shelby and then we had a coupe, a fastback, followed by seven more coupes. Then came this beautiful red machine, pretty good, huh? I can see this line in my sleep. Did you notice these dates on the warranty plates? They all say “03F” or “04F”. That’s code for the scheduled build date. June third is “03F”. Sometimes we run ahead and sometimes behind. It’s just a scheduling date. You can’t really tell when the car was made by reading it. It all depends on parts availability down the lines. The next code here is the sales ordering district. Almost all of the cars we build here go to the east coast and the southern states. You may have noticed that Shelby that went through had a longer DSO code? That’s just a batch number, so we can keep track of them. They all go the same place, so you can’t tell where the car will ultimately end up, like a Mustang. 497 has an optional hood. This one gets the turn signal lights. Not all cars have those little babies. Pardon me for a minute. Most of those Shelbys don’t even get a hood until they leave the plant. Then they just throw junk or unfinished fiberglass on them. They have all the same wiring you know? Number 500 for this rotation. Welcome to my station. Nice color. Gulfstream Aqua. I haven’t seen any Shelbys this color either, absolutely gorgeous. This little coupe is probably going to be someone’s baby. That’s new 302 motor is going to run forever. I would add a few options if I could, but I am not allowed to do that. The Shelbys are all built the same. You can’t order anything special on those cars. Here comes a convertible coming down the line. Let’s see it’s been sixteen cars since that Shelby went through. I did mention most of the cars are coupes didn’t I? We have seen quite a few six cylinders and 302s. This one is Meadowlark Yellow. It also has the optional hood and a console. I think it will look pretty good with this new black top. Rotation 503…. here we go. This little coupe is going to be in a rental fleet. The sheet says Atlanta. 504 is a lime green convertible. We are back to where we started. The difference here is this one has all its parts. It’s not like the other one. Do you want me to do the trick again? I can recite every car back to you if you like? Sorry you only got to see one Shelby. Hey, that’s the way it is on the production line. You didn’t even see a 390 or a new 428CJ car during your visit. All of the information in this story comes directly from a group of 19 build sheets found inside of a 1968 Shelby. All the cars represented in the story are real and described as they were built on June 3, 1968. A special thanks to Kevin Marti for identifying the actual build date of these cars. The photograph is from Life magazine.